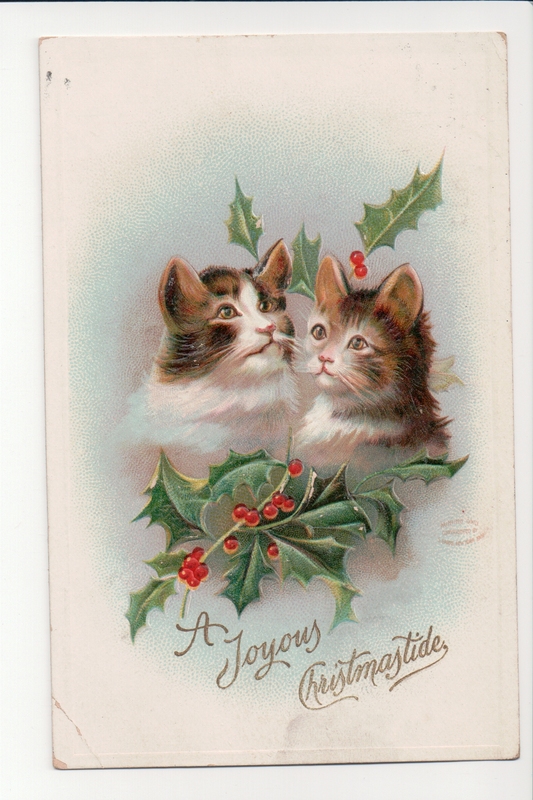 On this fourth day of the Postcard Advent Calendar I share a Christmas “meow” from 1909. The lightly embossed kittens send young Donald Minor wishes for a joyous Christmastide. The publisher’s mark is right below the right kitty and reads “Painting only. Copyrighted by S. Garre, New York 1909.” Small print on the back indicates that the Series #1064 postcard was printed in Germany. The note’s salutation has led me on a goosechase to find the connection between Donald and Ivan. The postmark is stamped Tama, Iowa, December 22, 11am, 1909. And while some Pennsylvania Minors migrated west to Ohio, Illinois and Iowa in the mid-1800s, I don’t recall seeing the name Vannroy in any other family documents. In fact, I can’t find any Vannroy in my Iowa census stumping….My genealogical skills have failed me. So far. I love chasing the family geese. In researching other Advent cards, I went back to the web-based genealogy for the Thomas Minor family, from whom I am descended. Within the surname list I found the word I was hunting: VANNOY. When I plugged this spelling into Ancestry’s search engine I confirmed the Thomas Minor Society’s information. Francis Marion Minor had three children older than Donald’s father, Robert. John P. was the eldest, then Alfred (whose son Carl also wrote to Donald), then there was Sarah Pricilla. Sarah married Mark Herrington and had Beatrice Jane. Beatrice Jane married John Vannoy and had little Ivan in 1906. They are cited as living in Tama, Iowa in the 1910 census. Story unfolds: Sarah’s daughter Beatrice marries and moves west to Iowa. She travels home in 1909 with her family, including young Ivan, before winter sets in. The Christmas kittens are then sent in Ivan’s name, to the young cousin with whom he played during his Pennsylvania visit. Previous Article Postcard Advent Calendar, December 16: A Merry (European) Christmas! Next Article Surname Saturday: The Minor Postcard Advent Calendar, December 18: Sneaking Up On Santa! honk if you love kay’s kitties!